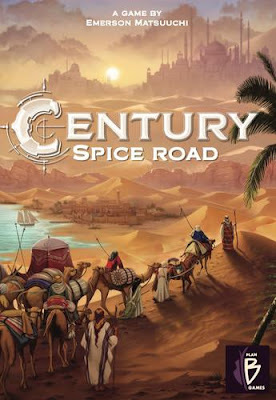 Published by Plan B Games, Century: Spice Road is a light, easy board in which the players are spice merchants on the spice road who trade spice back and forth in order to make the right sale. Each merchant begins play with some turmeric and the means to harvest more turmeric as well the ability to trade this turmeric up into other spices—safran, cardamom, and cinnamon. Eventually they will have the right combination of spices to make the right sale and thus acquire gold. In fact, this is the very light theme to Century: Spice Road, a well-appointed game designed to be played by between two and five players, aged eight and up, which takes no more than forty-five minutes to play. The spice itself is represented by wood cubes, which are in ascending order of scarcity and value are yellow (turmeric), red (safran), green (cardamom), and (brown) cinnamon. The game comes with a plastic bowl for each of the four spices and the four bowls are placed in this specific order of scarcity and value. The game’s cards, all large, with full colour illustrations, and easy to hold in the hand, are divided into two categories. The first category of cards consists of Point Cards, which are purchased with the right combinations of spice and score a player Victory Points. The more difficult the combination of spices a Point Card requires to be purchased, the greater the number of Victory Points it awards a player. The second category of card is the Merchant Cards. These are broken down into further types—Spice Cards generate spice for a player; Upgrade Cards enable a player to change spice into a better spice, for example, turmeric to safran or safran to cardamom; and Trade Cards that enable a player to trade in spice for more or better spice, for example, two turmeric for two safran or one cardamom for two safran. Game set up is simple. Each player receives some spice—the amount varies according to turn order—and the same two Merchant Cards. Each player also has a Merchant Caravan card where he can store his spice. The bowls of space are arranged in ascending order of value and scarcity. Five Point Cards are laid out face up in a row, with the game’s gold coins placed above the first Point Card in the row and its silver coins placed above the second card in the row. Six Merchant Cards are placed in a row below the Point Cards. Each time a Point Card is purchased or Merchant Card is taken, the line of cards is shuffled down and a new card is drawn to replace it. On a player’s turn, he can take a single action, which can be one of four things. He can play a Merchant Card from his hand. This can be to generate more spice with a spice Card, to improve his spice with an Upgrade Card, or get more and better spice with a Trade Card. He can acquire a Merchant Card from the row. This can be any Merchant Card in the row, but on each of the Merchant Cards to the left of the one he wants to acquire, he must place a spice cube. The leftmost card is always free to take, but as players acquire the Merchant Cards they want to the right of this card, they fill the other cards up with spice and make them attractive options to acquire. He can claim a Point card by paying the right combination of spices. If there is gold or silver coin above the Point Card, the player also gets that. Lastly, he can rest. When a player plays a Merchant Card from his hand, it goes into his discard pile. By resting, a player can take the Merchant cards in his discard pile and put them back in his hand. A game of Century: Spice Road lasts until one player has claimed his fifth Point Card—sixth in a two or three player game—and the round is completed. The player with the most points from a combination of Point Cards, gold and silver coins, and spice cubes other than turmeric wins the game. Century: Spice Road is a very simple game and that simplicity gives it some interesting twists. By acquiring Merchant Cards, what each player is doing is building his own deck, but as a deckbuilder, Century: Spice Road is a very, very slow deckbuilder, with just one card being played from one turn to the next. It means that any engine to generate and improve spice a player develops ticks simply round whilst still giving him the flexibility to change his next action, whether that is to acquire a new Merchant Card or change his current objective because another has claimed the Point Card he wanted. The limited number of possible actions and only having the one action per turn means that a player’s turn is short. Especially if a player spends his downtime working out what he wants to do. Ultimately, this makes a game play quickly and means that it is not a complex game. Game play of course revolves around the Merchant Cards. Of these, the most popular type of Merchant Cards are the Spice Cards which generate spice and the Upgrade Cards which change spice into better spice. Yet they are not the most prevalent type of Merchant Cards. These are the Trade Cards that enable a player to trade in spice for more or better spice. Whilst some of these do help improve the types of spice a player holds, a great many allow the player to effectively trade down to give him more spice of a more common type. And more spice means that a player has more with which to Upgrade or Trade up. What this also means is that Trading down is as important as Trading up because having more spice gives a player more options and always ensures that he has spice to do things with. Physically, Century: Spice Road is handsomely presented. The cards are bright and colourful, the inclusion of plastic bowls to hold the spice cubes is nice, the wooden spice cubes and the gold and the silver coins in metal give the game a pleasing physicality, and the rules are covered on two sides of a smallish sheet of card. They are easy to read and pick up, so Century: Spice Road can be unpacked, the rules read, and a game begun in a surprisingly short amount of time. The simplicity of the rules also makes the game easy to teach. Now Century: Spice Road has been compared to Splendor, published by Space Cowboys. The comparisons are not unfair, since they have similar mercantile themes and the need to collect resources to then trade up for better resources. Yet Century: Spice Road is not as cutthroat a game, not as tight, and a much more sedate game, even forgiving since it is easier to adjust to the changing strategies and objectives of your players. Whereas in Splendor, the players will often be competing for the same resources. This is not to say that Century: Spice Road cannot be like that—veteran gamers are likely to play it like this than family gamers are—but it is easier and more forgiving. As easy a game as Century: Spice Road is, there are complexities to the play—the need to Trade down as much as up, for example—that do not quite make it suitable as a gateway game, like Carcassone, Settlers of Catan, or Ticket to Ride. It is not too much more complex than either of those three games, so it is perhaps a game to be played after a gateway game like one of them. Century: Spice Road offers solid play and challenges as a slightly longer filler for veteran players, but for a family audience or players looking for a lighter option, it is a thoroughly pleasing and enjoyable game. Either way, Century: Spice Road deserves a place on your gaming shelves and space on your table.